pebblewriter: Which Lie Did We Tell? Which Lie Did We Tell? Reading the employment reports these days reminds me of the story told by William Goldman, celebrated screenwriter of such classics as Butch Cassidy and the Sundance Kid and All the President's Men. He was waiting for a producer to get off the phone when the man suddenly cupped his hand over the phone and shouted to his assistant: "Bill, Bill! Which lie did I tell?" When we learn that the government is unable to keep track of the number of its own employees from month to month, how are we supposed to trust that any other number that purports to tell us how many folks are employed in offices, warehouses and saloons across the nation? In the "bad news is good news" (more QE) and "good news is good news" world in which we're living, this morning's jobs report is -- surprise! -- good news. We're still long from yesterday's low, but coming up on important resistance. This morning will be about figuring out when to sell. 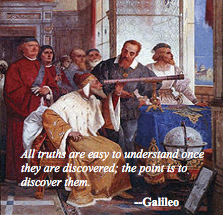 I suspect 1615-1616 would be nice. The dollar shot up on the news to an important channel line and the .618 retracement of its fall since Apr 24, but is dropping back. How far it falls could be quite telling. Note SPX just hit the top of the red channel within the broader purple channel, as well as the 1.272 Fib extension of the 1597-1536 drop from Apr 11-18. But, odds are they'll have to wait for a back test of the lines of important resistance just broken. It's not that the 1.272 Fib line is that important. 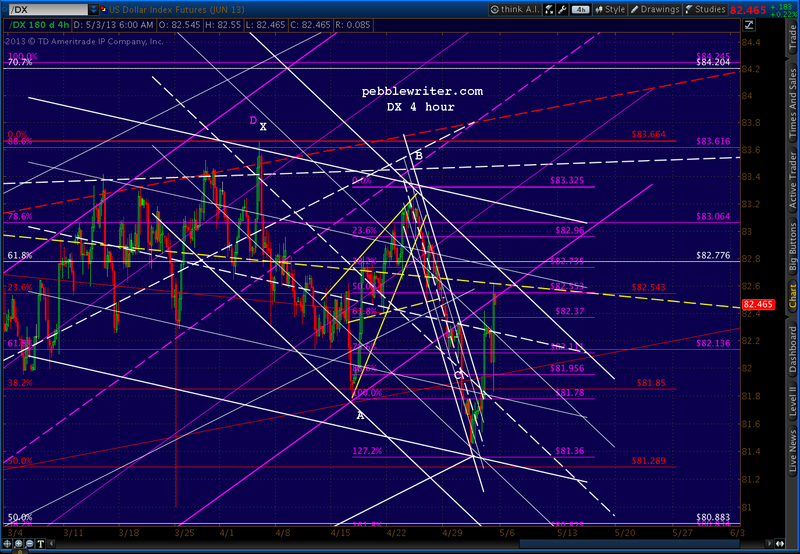 There was no meaningful .786 reversal, so this harmonic pattern is much more likely to extend to the 1.618 at 1635. This was our upside target if SPX was able to break through the resistance it just did. And, we're at an unusual point on the purple channel -- the .625 line. The .75 would be a much more common end point. Looks like SPX is breaking out of the red channel, triggering our 1618 stop. So we'll switch back to the long side for a likely run up to 1624ish. Stops at 1614ish. The red channel is drawn with the best fit on the interior points on the 15-min chart. But, by the time you examine a channel on longer time frames, all those precise reversals at the channel lines pretty much disappear. In other words, there's always wiggle room. In fact, I'm going to switch back a short position here at 1618 just to protect against the possibility that wiggle room is at work here and the "break out" mentioned a moment ago is a false alarm. If SPX pushes back up through the top of the red channel, I'd be content with an interim long position for a trip to 1624 rather than switching sides all together. On the other hand, if it dips below 1592 in the morning, it has downside risk to the channel bottom at 1576 [it hit 1581] where it would likely catch a bid and start a run to 1635. That way, the Inverted H&S Pattern would feature a neckline that’s roughly the same as the purple channel .25 line, and would target the same price level as the 1.618 extension of the 1597-1536 slide: 1635. There was a Santa after all! The Dow soared 205 points, the S&P; 500 over 21. The next two days tacked on 13 more points. At that point, SPX was just 10 lousy points from completing an inverse head & shoulders pattern that might have sent it up 125 points to 1635. We all know the rest of the story. Suffice it to say there were a lot of hangovers those next few weeks that had nothing to do with New Year celebrations. SPX dropped 120 points in 2 weeks, 230 points in 4 weeks and 750 points by the following Christmas. But, all was not lost. After peaking at 1576, SPX went on to construct another IH&S that looked promising. 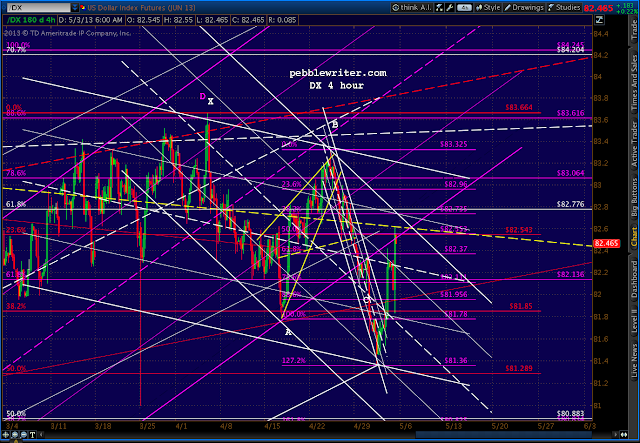 If it completed, it would have targeted 1635 -- indicated by the dashed yellow horizontal line. It came within 10 points on Dec 26, but couldn't quite close the deal. As I wrote in July 2011, the rest was history. That 1635 IH&S target would have to wait...until now. BTW, I've extended and expanded the current membership offer through the end of the weekend. Charter Annual memberships at $1,200 fix your subscription price for the life of the site. Annual memberships are slated to increase to $1,800 when this deal is done and $2,500 when the upcoming fund is launched. Click HERE to sign up.